Our shoulder is composed of three bones. The humerus is our upper arm bone. The clavicle is what we call our collarbone. The scapula is the shoulder blade that moves on our back. An part of the scapula, called the acromion, forms the top of the shoulder. There are a total of four joints in our shoulder complex. The humerus and the scapula form the main shoulder joint, the glenohumeral joint. Osteoarthritis is the most common type of arthritis, affecting some 21 million Americans alone. It tends to develop as people grow older. Osteoarthritis can result from overuse of a joint during sports or work. Post-Traumatic Arthritis can develop in individuals of all ages after a shoulder injury, such as a fracture. Osteoarthritis causes the cartilage covering the end of the bones to gradually wear away, resulting in painful bone on bone rubbing. Abnormal bone growths, called spurs, can grow in the joint. The bone spurs add to the pain and swelling, while disrupting movement. A deep ache is the primary symptom of shoulder arthritis. In the early stages of arthritis, your shoulder pain may get worse with movement or activity. As time goes on, your shoulder pain may become continuous, even when you are resting. It may be severe enough to keep you awake at night and interrupts the ability to do every-day tasks such as putting on a belt or carrying groceries. Inflammation can cause your shoulder joint to also feel swollen and stiff. Your physician will order X-rays to see the condition of your shoulder bones and to identify areas of arthritis or bone spurs. Sometimes your doctor may order Computed Tomography (CT) scans or Magnetic Resonance Imaging (MRI) scans to get a better view of the bone and soft tissue structures. These imaging tests are also painless. They require that you remain very still while a camera takes images of your shoulder joint. CT scans provide a view in layers, like the slices that make up a loaf of bread. MRI scans provide the most detailed images of the tendons and ligaments. 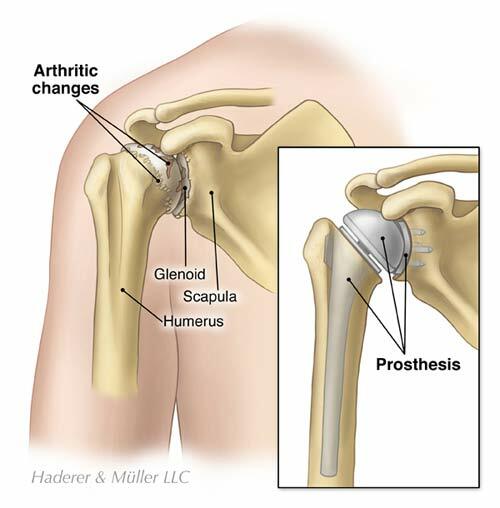 The goal of Shoulder Arthroplasty is to relieve pain and restore shoulder mobility. The surgery is performed as an inpatient procedure, and you may expect to stay in the hospital a day or two following your surgery. You will either require general anesthesia or a regional nerve block for the procedure. 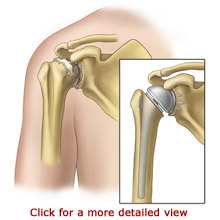 There are a few different types of shoulder replacement surgeries. Another form of replacement is resurfacing Arthroplasty, when the cartilage is removed from the humeral head and a metal "cap like" prosthesis is placed over it. Some cases of shoulder arthritis can be treated with non-surgical methods including rest. Over-the-counter medication or prescription medication may be used to reduce pain and swelling. If your symptoms do not improve significantly with these medications, your doctor may inject your joint with corticosteroid medication. Corticosteroid medication is a relatively safe pain reliever. Occupational or physical therapists can help you strengthen the muscles surrounding your shoulder joint. Your therapists may also apply heat treatments to help ease your pain and stiffness. Aquatic therapy in a heated pool may help relieve pain and stiffness, while providing you with gentle support while you exercise. Your therapists may recommend ways for you to do your daily activities, such as housework and meal preparation, in a manner that puts less stress on your shoulder. Shoulder Arthroplasty is recommended when non-surgical treatments have provided minimal or no improvement of your symptoms. If you receive surgery, your surgeon will restrict some arm movements for a short period of time following your procedure. You will wear an arm sling for some period of time after surgery. An occupational or physical therapist will help you gently move your arm starting on the first day following your surgery, or on the day of surgery. You will gradually work towards moving your arm independently. You will learn exercises to strengthen and increase the movement in your shoulder. When your incisions are healed, you may participate in aquatic therapy. The heated pool environment may help relieve pain and stiffness while providing gentle support while you move your joints. Eventually, your therapists will provide you with a home exercise program. Your shoulder will need several months to fully recover from the surgery. Generally, Shoulder Arthroplasty rehabilitation takes from three to six months. Your recovery time will depend on the extent of your condition and the amount of surgery that you had. Your surgeon will let you know what to expect. Overall, most people achieve good results with shoulder replacement surgery. They experience an improved quality of life because of decreased pain and improved function.